It’s time to feel proud again as Eduncle.com has marked a massive success in IIT JAM with 960+ selections over the span of 4 years. Going back in time, let's look at the journey through which Eduncle.com became the 'Golden Standard' among IIT JAM Exam Aspirants and Toppers. In the very start i.e., 2016, we were able to grab 70+ selections in IIT JAM. And since then the journey of success never took a pause. In the year of 2017, 100+ students from Eduncle.com got selected in IIT JAM, making it another milestone in the Success Journey. Continue this legacy, in 2018, Eduncle.com achieved yet another triumph by getting 270+ selections. And now, Eduncle.com has proved itself with more than 510 selections in 2019. Out of which 34 students are under top 100 ranks. And not just that, 3 of them have managed to grab single digit ranks. AIR 2 in Mathematics, AIR 3 in Mathematical Statistics and AIR 6 in Physics. 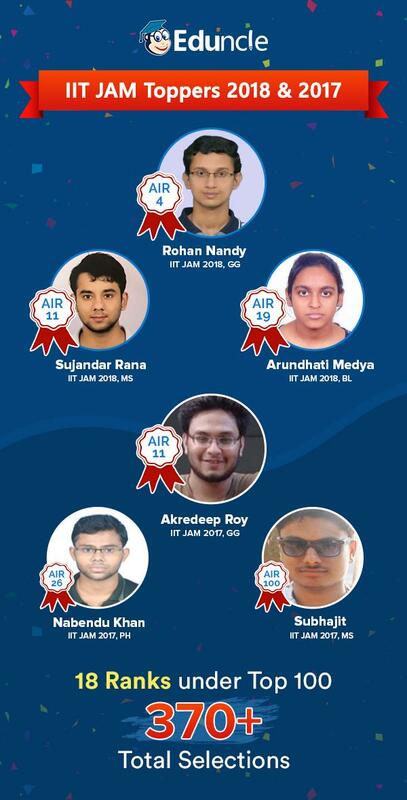 We feel immense pleasure in sharing the names and ranks of our 510+ students who got selected in IIT JAM 2019. Please check the list of subject wise ranks Eduncle grabbed in IIT JAM 2019 below. Make your IIT Dream a Reality with Eduncle! Get our JAM Study Material and Score Better - Get the free Sample Theory! Geology is a subject which is popular amongst IIT JAM aspirants. This year Eduncle has given outstanding results in IIT JAM Geology with AIR 11, Sayan Sen being one of our star performers. In IIT JAM Chemistry, the enrolled students have continued to achieve great ranks with our Study Material and Question Bank. Here are the Rankers of IIT JAM Chemistry from Eduncle. We have got overall 64 selections in IIT JAM Biotechnology 2019 Exam. With 72% selection rate, Eduncle has set a new standard among JAM Biotechnology Courses. Rupin Shaha, Mrs Deepa Shaha. IIT JAM 2019 - Success Stories & Achievers’ Reviews! As already mentioned, the success of Eduncle in IIT JAM 2019. Here is the list of our toppers and what they say about Eduncle. Eduncle has a responsive doubt solving team which solves & provides good solutions for your queries within 24 hours. Its online study material has comprehensive notes covering the entire syllabus, abundant solved problems & Question Bank. Time management is very much important in IIT JAM. Eduncle test series for IIT JAM MS helped me a lot in this portion. I am very thankful to the test series I bought from Eduncle. Eduncle served as my guiding light. It has a responsive doubt solving team which solves & provides good solutions for your queries within 24 hours. Eduncle Mentorship Services guides you step by step regarding your syllabus, books to be used to study a subject, weightage, important stuff, etc. I recommend all aspiring JAM students to join Eduncle.com for great success. Eduncle, Study Material was really helpful & specific according to IIT-JAM Exam Level. They helped me to move closer to my dream career. I got AIR in BL 40 and in BT 94. Thank you so much Eduncle for support. I feel happy to have trusted the question bank from Eduncle. The individual mentorship, online access to material and sample weightage on Maths (for Biological Sciences especially) are highly appreciable. IIT JAM 2018 & 2017 Winners from Eduncle! With the release of IIT JAM Result, Eduncle notched up more than 370+ selections in IIT JAM 2018 & 2017. We feel proud to announce it that the aspirants who started their JAM Preparation with the exclusive study material provided on Eduncle have scored very well in the exam. Register for FREE at Eduncle & Target High score in IIT JAM Exam. The candidates who are going to appear in future IIT JAM Exams may take help of the quality education offered by Eduncle. A place trusted by IIT JAM top rankers and qualifiers. We congratulate all the students on their success and wish all the best for their future journey. Your success is what we ultimately celebrate. Our success lies within our students. We promise our future students to make their IIT JAM Exam journey easy and fulfilling in all ways. With our JAM Study Material, we assure you exceptionally personalized preparation with consistent follow-up and follow-through mentoring. If you’re not satisfied, neither are we. Our team is available to address any concerns. You can leave a comment to us in the comment section below so that our mentors can reach and help you with the perfect guidance.